In New York, defensive driving isn’t just about keeping yourself and other people on the road safe. It’s also about keeping animals, particularly deer, safe. While deer may not be living in Midtown Manhattan quite yet, they line the shoulders of roads in virtually every other part of the state. Here are some defensive driving tips to help you avoid hitting deer this spring and summer. Most New York insurance policies won’t give you a discount for installing deer whistles on your car like they often do for putting in anti-theft alarms, but deer whistles seem to be much more effective than car alarms. When air flows through the whistles, they produce a high-pitched sound that deer can hear but people can’t — and deer often do perk up when they hear the noise. Have you ever actually seen a human react that way to a car alarm? Deer whistles are inexpensive, and they’re easy to install. Most auto parts stores sell them for a few dollars. To put them on, just pull off the paper or plastic on the bottom of them and affix them to your car’s front bumper or grill. They have an adhesive on the bottom that will secure them. Most packs have two whistles, in case one is knocked off. Perhaps the most important thing you can do is slow down, especially when driving at dawn and dusk when deer are most active. You should, of course, never drive over the speed limit, and you may even want to go slower than the speed limit on some roads when visibility is reduced. Slowing down will give you more time to react when you see a deer. Because deer are most active in the early morning and late evening, it is difficult to spot them when the sun is low. If you’re driving with your headlights or high beams on, watch for beady little eyes along the side of the road — and start braking as soon as you see some. Deers’ eyes are reflective and, therefore, are easier to see than the rest of their bodies in low-light situations. 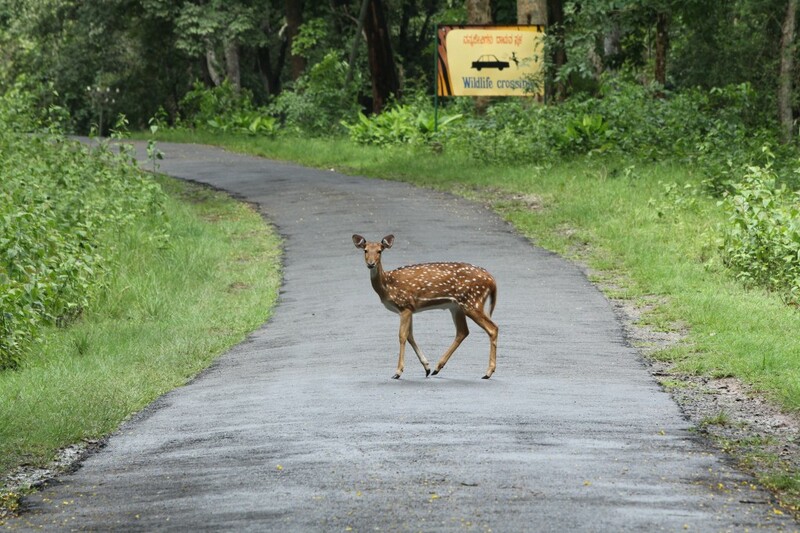 As soon as you see a deer on the road, start braking and honking immediately. Even if the deer seems a safe distance away, there may be others that you don’t notice. They often travel in small groups. Slowing down will give you time to scan for other deer, and honking will alert any other deer that are nearby. If hitting a deer is unavoidable, don’t dangerously swerve to avoid the collision. Colliding with a deer is preferable to hitting an oncoming car or stationary object, like a tree. A deer will likely damage your car, but most deer collisions don’t result in any injuries or deaths. Hitting an oncoming or stationary object greatly increases the likelihood that someone will be hurt in the accident, or worse. When you get behind the wheel, remember to watch for deer. Even though New York State has an overabundance of them and their meat can be delicious, deer are best left to hunters. Use these defensive driving tactics to avoid hitting one, and both you and any deer on the side of the road will be glad you did.